I am privileged to be a part of Free Being Me. It is a programme I experienced to build body confidence and self-esteem among young girls who don’t believe in themselves and are influenced by the Image Myth displayed in the media. Images displayed usually have all the qualities that the community thinks is supposed to be possessed by a beautiful person. These include light brown skin, big bums, dimples, pointed nose, and ‘American height’. These force girls to opt for bleaching and makeup to be like girls they see in magazines- and yet they don’t exist. But FBM gives you an opportunity to appreciate yourself, by loving every bit of your body, remaining natural and accepting yourself despite what other people say about you. It also helps us to escape side effects of ‘improving’ ourselves for we are fearfully, uniquely, beautifully and wonderfully made. 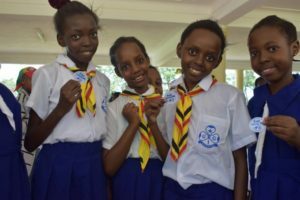 I urge girls everywhere to be aware of those myths and to join guiding for more projects that will benefit them and the community as well. Be bold and confident for you know who you are!